Want To Know Is Frosted Window Film Right For You? Home › Frosted Window Film › Is Frosted Window Film Right For You? Is Frosted Window Film Right For You? Have you ever noticed that attractive frosted appearance on panes of glass, the type you often see in a corporate office? Maybe you’ve spotted it on a local storefront as you walked by? If so, you may have wondered how this window frosting effect was achieved. One method, of course, is using frosted glass itself. However, depending on your location, design needs, and budget, this approach may not be feasible for you. Did you know you can attain the same sophisticated appearance with frosted window film from SSK Signs? Our frosted window film offers a plethora of textures and transparencies while providing you unlimited creative opportunities to showcase your brand. This approach to window frosting still allows in natural sunlight, while diffusing its glare and enhancing your privacy. 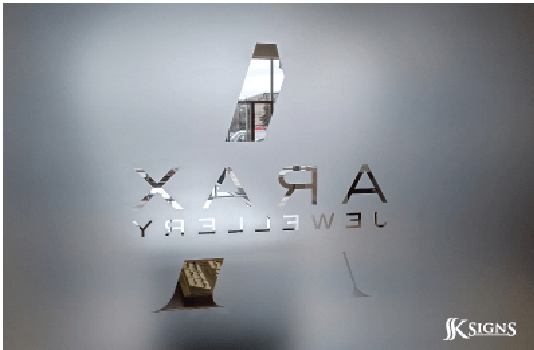 SSK Signs has created custom frosted window film for an array of industries: technology, healthcare, agribusiness, commercial real estate, and jewelry, to name just a few! Virtually any company can benefit from the prestigious appearance that frosted window film provides, and every company can enjoy a film that’s custom-cut to perfectly complement their brand. We created this film for a Toronto jewelry company. Note the large scale of the window frosting effect; it covers most of the door. Our client chose a “knock-out” effect for their logo – the logo itself is the only area where the viewer can see through the film. The effect is striking. As you walk back and forth in front of the door, you see the outside (or inside) world appear only through the frame of the logo. Did you know it’s even possible to create one-way privacy window film? Yes, that’s right – it’s similar to the effect you’ve seen in police films and TV shows (but more friendly, of course). Your staff can see out, while passers-by cannot see in. Ask SSK Signs how it’s done! Ready to add sophistication, enhance privacy, and enrich your branding with frosted window film? Contact SSK Signs today and request your quote!